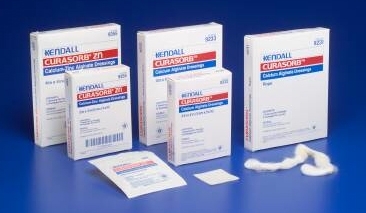 KendallTM Curasorb Calcium Alginate Dressings are designed to interact with sodium in wounds to create an ionic exchange and help jump-start the epitheliazation process. The dressing absorbs approximately 20 times its weight in exudate. It is easy and painless to remove with minimal tissue trauma. Kendall Calcium Alginate Dressings are designed with a gel block feature with unique fiber configuration that encourages vertical wicking which pulls exudate straight through the dressing allowing more efficient exudate removal. Curasorb Calcium Alginate Dressings are designed for comfort and healing. They will have minimal shrinkage to help prevent maceration of the periwound. The isotonic sodium configuration is gentle on the wound. The stable gel formula is a higher percentage of guluronic levels that allows easier removal and minimizes trauma. This will also help maximize patient comfort during removal and debridement.